I can’t get a refinance on my mortgage. I bought in 2006 and financed the place as best I could at the time. The first year with the mortgage was a real bear, which is pretty normal as you adjust your life around the biggest investment you’ll most likely ever make, but I got on top of things the next year. That’s not to say things are easy now; they’re not–they’re just easier. I’m still shelling out quite a bit each month to cover the mortgage, but manage well enough (and perhaps better than many others in these economic conditions). But time grinds on, and no matter how comfortable and able I may be, things can change fast. Before I knew it, there was a housing cataclysm and the value on all 48 condos in my complex plummetted. Now instead of me holding down my mortgage, my mortgage is holding me down. More specifically, it’s holding my head underwater. The bank keeps calling to tell me about the phenomenal rates available and how I should refinance, but after a trio of failed investigations into what a refinance would cost given what I owe and what the place is worth, those calls have become nothing but teases. I’ve asked the bank to stop calling. None of this is to say that I’m poor. I’m not. I have very little debt. In fact, besides the condo, the only thing I owe money on is the laptop I’m using right now. I haven’t missed any bill payments since I don’t know when. I’m not struggling to make ends meet. I’m not hungry. My pantry is stocked for nuclear winter. My school district is preparing to strike, and I’m set-up well enough to navigate those rough waters for as long as I think they will last. I can live a comfortable, somewhat modest life on my salary and savings. I’m not going to be changing jobs or forced to relocate, so I can in all likelihood ride this out over the next several years with minimal consequence to my normal life. But I’m still facing the cold reality right now that I won’t soon have any significant release of financial pressure. By my estimation, I have roughly the same chances of getting a refinance that I do of winning the lottery. So to spite Fate, I’ve decided to play the lottery. What do I have to lose, besides the $10 I allow myself per week? I barely feel the pinch of $10 throughout the course of a normal week anyhow, and $10 isn’t that much to play the sucker on Wednesday and Saturday nights. Besides, if I follow the right superstitions, won’t that increase my chances of winning? Let’s hope so. I realized three weeks into this ill-advised diversion that I had already established a set of routines: I play Powerball only, I buy five double-play tickets per week at the gas station down the street from my condo early in the week (preferably on Sundays), I get quick-pick numbers only, I stick the tickets to the refridgerator for Wednesday’s drawing and then move them to my desk for Saturday’s drawing, I roll over winnings of $10 or less into the next week’s drawings, and I check the winning numbers on my home computer only. I can’t think of another area of my life that has become characterized by such structure so quickly, except maybe running 5Ks. But that’s more about preparation to succeed, not the blind hope of winning big. My own strange wealth-motivated behaviors aren’t the only ones I’ve noticed in the past few months, either. I have taken considerable note of what happens when lottery jackpots soar so high that the mere contemplation of the sum is enough to induce vertigo. There was such a jackpot a few weeks ago when Powerball was jacked up to $245 million. I no sooner said “Lottery pool” in the office than seven people jumped in–3 of whom said they’d never so much as bought a lottery ticket before. The possibility of sudden filthy wealth had us all seeing stars. Several pool jumpers commented optimistically to me, “What the hell?” Given our current labor situation, there were other sentiments expressed, too. Most of them involved a specific set of instructions about where certain persons can deposit the contract we’ve been offered should we hit the one shot in 195,249,054. Not that it mattered: We bought forty tickets, and none of them scored more than two of the numbers. Maybe next time. None of these contemplations is meant to gloss over the fact that the lottery is a total sucker’s bet, and the people least financially able to play it are the one who are routinely the biggest suckers. Never having been a lottery player, I didn’t realize how many lottery games there are, and there are more than enough to feed a serious addiction. If you consider drawings alone, you can be in as many as forty drawings per week in Illinois. If you prefer scratch-offs, I counted 48 different ones on the Illinois Lottery website–some that go for $20 and $30 a pop. Both the drawings and the scratch-offs are glitzy enough to milk the indiscriminate consumer who thinks it’s his turn to beat the odds. I know first-hand, too, the fool’s paradise the lottery can create in a player’s head. It’s nice to sometimes daydream about being financially independent for the rest of your life or to envision driving a Lamborghini down Lake Shore Drive to hop on your boat for a cruise on Lake Michigan, but it’s far more important to accept and live within your own reality, and to make steady, if small, steps towards improving it. I caught myself daydreaming all too much the first few weeks when I started playing, until the reality of the odds finally sunk in. It took completely crapping out on Powerball and MegaMillions two weeks in a row to see the truth, and that didn’t happen until several weeks into the experience because the first week I won back almost all my money, and the second week I won half of it back. What kind of fool dreams big after breaking even on a $10 bet? I’ll give you a hint: he’s 6′, 195 lbs, and writes a blog. The idea of sudden filthy wealth from the $245 million jackpot a few weeks back got me to thinking about how I’d spend the money. Most likely, I would put my teaching career on the back burner for a little while and become a newly-minted Doctor of Creative Writing in about three years. Most programs can be negotiated in two years, but I’m certain I would lose considerable study time due to the phenomenally long vacations I would take to relieve all the stress from studying. Heck, I’d probably do the same with a jackpot a mere fraction of the $245 million up for grabs. Until all that comes to pass, though, I’ll live my normal life in middle-class reality. I’m pretty happy with it, especially when I can flick Fate in the nose twice a week. I used to go to Chicago Bears games with a small degree of frequency. A decade ago,when I lived a lot closer to the city and my buddy Scott had tickets, I would make one or two a year. They were hard to pass up. The tix were free, along with admission to the WBBM hospitality tent before the game. What would you do? But life changes, people move, and the past becomes nostalgia. I hadn’t been to a Bears game for eight or nine years until tickets fell in my lap last week. I corralled my buddy Adam, and we made a go of it. We’d been planning on getting together Sunday anyhow to watch my beloved Colts take on his beloved Patriots, but passing up that laugh-fest to actually go to a game was a no-brainer. As such, I was standing on the Libertyville Metra platform at 9:05AM Sunday morning, ready to take the train downtown. There were at least 25 other fans milling around, hoping to soothe the nervous hoping that has resulted from Jay Cutler going down with a possible season-ending injury a few weeks ago. Before that derailment, we had built up head of steam and were chugging towards the playoffs. According to Nick Rossie, a former college slot receiver who sits next to me in the office, the whole deal was Johnny Knox’s fault. If he hadn’t fallen down on the play that resulted in an interception a few weeks back, Cutler wouldn’t have hurt his hand taking down the defender who had the ball. Nick demonstrated Knox’s faulty technique last week, cutting on the carpet by our desks in his black dress shoes, his arms cocked as if in mid-stride. He showed us the actual footwork involved, noting that Knox should have cut into his crossing pattern off his outside foot. Knox cut off his inside foot, thus falling down and missing the pass. An interception and return followed, and before you could say “fundamentals,” the Bears’ season was on the line. But misery loves company, and the two dozen fans ready to hop the train took comfort in the company of others who believed that all our boys had to do to make the playoffs was win 3 very winnable games out of the 5 remaining. One of those very winnable games would kick off in 3 hours, and many of us couldn’t help but mutter about the patheticness of the opponent, Kansas City. Our revery was broken by the slam of a car door deep in the guts of the parking lot, followed by a voice bellowing, “Let’s go, Chiefs!” A minute later, two guys clad in red and yellow stepped to the platform. One toted a 12-pack of Bud Light; the other wore a babushka with the ear flaps raised. They weren’t alone in their displays of loyalty. I saw a few others at the end of the platform wearing the Chiefs colors, and one woman sat on the bench outside the station wearing #96 Chiefs home jersey with the name “Studebaker” on the back. Had I been as brazen as any of them, I would have shown off what I had on beneath my sweatshirt and jacket: My cherished #8 Cade McNown jersey. I exposited about it last January when the Bears were in the playoffs, and that particular entry has since become the most-viewed entry in the history of The Seeker. If nothing else, the ironic fashion stylings of fans boarding the train got me to thinking of a game Scott and I made up one Sunday morning outside the WBBM hospitality tent as we noshed brats and sipped suds. We were remarking on the varied and often tacky attire of fans passing by, and got to thinking that you could guess where a fan was from based on what he wore to the game. We dubbed our musings “North Side / South Side,” and the rules were pretty simple. If someone walked past wearing leather, an authentic team jersey, all black, or were in some way “dressed up” for the game, we identified them as North Siders… Lincoln Park, Lake View, Wrigleyville… all that. Carharts, hardhats, knock-off jerseys, face paint, and the like all pointed to the South Side… Hegewisch, Calumet Heights, Washington Park, and so forth. We didn’t draw any lines for suburbs, probably because we didn’t want to target ourselves. The train pulled in to Union Station at 10:20. I stepped off right behind two fans dressed as Santa Claus. I set off to locating Adam. We’d meet up with my friends Cora and Sandy, and then we’d be off to the game. I tromped through the station, trying my best to staunch a lingering fear I’ve had ever since watching The Untouchables. Someday, though, it’s all going to come down. There will be a shootout between treasury agents and the mob, and I’ll get caught in the crossfire. It didn’t happen Sunday, though, because I found Adam and we were out the door with the quickness. Cultural commentary aside, “North Side / South Side” actually shows up a peculiar Chicagoism that you’ll never see at Comiskey Park or Wrigley Field. The whole city will unite behind Da’ Bears. People will call out down the street, strike up a conversation on a bus, or even light each other’s cigarettes if they’re both wearing navy and orange. That’s not so with the baseball rivals. People will fight each other for wearing blue or black and white. It’s an odd feeling sitting next to people, or walking past them on the sidewalk, knowing that you’re all behind the same cause regardless of the divisions between neighborhoods or suburbs. It’s almost enough to call it a “warm” feeling. I was lost in those thoughts as we approached Soldier Field and the double-tight security that the NFL has mandated league-wide–like we need a reminder that football is a violent game, and that violence too frequently seeps into the stands; if it’s not targetted towards the other team, then it can many times go towards visiting fans. No wonder there is a preponderance of on-site jails in NFL stadiums. I’m not sure how common they are in baseball stadiums. It definitely wrecks the effect, though, when you have worry about violence in the stands rather than merely on the field. 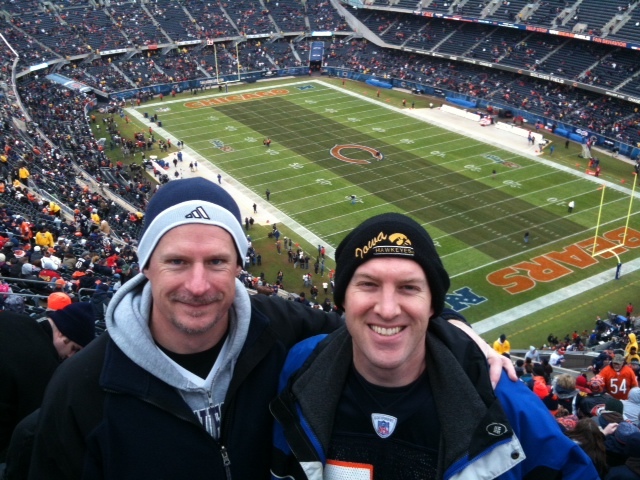 After wading through a sea of Walter Payton, Brian Urlacher, and Devin Hester jerseys, and climbing to a level higher than the luxury boxes on the other side of the field, we found our seats. Once we sat down, I banished thoughts of catching anything that happened to find its way into the crowd, or even hearing the distinct crunch of helmets from a crushing tackle. In the time before kickoff, a Punt, Pass, and Kick competition was played out on the field. We had no idea that some of those passes off the arms of eleven-year old kids would be the best we saw all day. Not to be outdone, a Pee-Wee football team took on a group of local mascots at halftime. One of the pint-sized pigskinners grabbed a deflected pass on his team’s fifteen yard line and took it all the way to the house, thus outscoring Da’ Bears on the day. We had no idea the game was going to be as horrible as it was. I know that’s cliche and easy to say when you don’t have much to say, but that’s all that comes to mind–it’s freakin’ impossible to imagine a game being as god-awful as that one was. The invasion of the Gallipoli peninsula looked better than what we saw. The only thing that looked somewhat familiar was the signature Bears defense. They kept Kansas City out of the endzone all day, except for a fluke Hail Mary at the end of the first half. Anybody who follows football knows that the surest thing to do when defending against a desperate heave is to knock it down. Da’ Bears did exactly that. Heck, if you watch highlights, you can even Brian Urlacher stuff it like a volleyball at Montrose Beach… right into the lucky hands of a falling Chiefs receiver. Dumb luck. Dumb luck was all the Chiefs needed, though, to walk away the winners, 10-3. Let me be clear about this: There were no offensive highlights for Da’ Bears. The backup quarterback was sacked 8 times and threw 3 interceptions–one in the endzone that would have tied the game. We ran for 93 yards total, a quarter of which came on one play. If it wasn’t enough that Jay Cutler was out, Matt Forte, the second most powerful offensive weapon, suffered a sprained MCL and was out before the end of the first quarter. He limped to sidelines with the full weight of his 1400 all-purpose yards for the season on his shoulders. Once he was gone, the conversations around us were more interesting to follow than the offense. Basking in the warm memories of the kidney stone I passed last winter was more rewarding than watching the offense. And to prove they aren’t total cement heads, the Chiefs kicked the ball away from Devin Hester all day. In short, they showed up and the star quarterback was already out. They took out the star running back, and then stifled the star kick returner. It was an ugly game plan, but sometimes ugly is what it takes to win. All that happened by the end was that I got to spend some time with a few friends. I can say that’s enough and only be half-lying. If I want to look deeper, I can remark on the peculiarity of being on the spot when Da’ Bears suffered the blow that killed both their playoff hopes and their season, for whatever that’s worth. I guess I discovered, too, that Da’ Bears as I have come to know them have lived their best lives as chunks of nostalgia that sometimes rattle around in my mind. It was great to go back to Soldier Field and absorb the zaps of gameday energy and relive the communal wonders of football (despite the horrid bathroom situation in the stadium), but I don’t really miss going to the games. I can live another few years before I get the itch to go again. Now please, God, please let someone beat the Packers. Preferably in the Super Bowl. This all went down three weeks ago. They did another EKG on me, then had me get on the treadmill with about 8 different wires stuck to my chest, along with a strap velcroed around my torso that kept all the wires attached and another monitoring device attached to me. They wanted to max me out at my target heart rate (22o beats per minutes, minus my age, times 70%–for me, that meant 152 beats per minute). The doctor said the test would take anywhere from nine to twenty minutes, probably closer to nine, and her assistant pushed “start.” It was easy enough at the beginning; we passed time talking about what books we like to read, and what the doctor can do about her middle school-aged son who refuses to read. They cranked the speed up a little bit until I was walking quickly, and our conversation continued. We were at 10 minutes, and I was still in the 110s. They increased the incline on the treadmill and said I could run if I needed to. I began to jog, and we started to talk about college football. They gave me a towel when I started to sweat. I commented that I was glad I had brought my running shoes and a pair of running shorts. The clock ticked past 13 minutes, and I was still in the 120s. They cranked the treadmill up to a 20 degree incline. I stopped talking and focused on breathing. Pretty soon, it was all I could do to keep up. I was at the 14 minute mark and wheezing. The doctor asked if I could go another minute, and I said I had thirty seconds in me maximum, and wasn’t even sure I could last that much longer. She shut down the treadmill, and I jumped off before I fell off. Normally, I’d grab some water and pace around at this point until I caught my breath, and even bend at the waste with my hands on my knees. Not this time–they made me lie down on a table immediately so they could take more measurements. I thought I was going to freak out. My heart was pounding out of my chest, sweat was gushing out of me, and I couldn’t catch my breath. Add to that the constriction I felt from the velcroed strap and sundry devices, and I thought I was in full anxiety-attack mode. I wanted to jump off the table and rip everything off, and fought the temptation to do so for what felt like several minutes. The readings they were getting were crucial, though, and since I didn’t want to screw things up, all I could do was endure. Things settled down eventually, and I was allowed to sit up on the exam table. They handed me another towel, unstrapped and unstuck everything, and told me that in a few minutes I could look at the results. I finally stood up and paced the room a little bit to work off the lingering feeling of panic. When I sat back down, we looked at the results. The first thing the doctor said was that she didn’t need to look at the results too closely (though she would) because lasting 14:30 told her about 95% of what we needed to know. Regardless, I got a quick education on what a healthy, strong, happy heart looks like when it’s under a lot of stress. So I can rest at ease with my heart. I worked harder on that treadmill than I do during a race, though it would be easy enough to use some monitoring device when I run so I can keep track of my heart rate. That, in turn, means I could probably run harder and faster and beat more people and win a few more age-division awards. Sounds like I’d love that, huh? But I won’t do it. I prefer to run more by feel. I prefer to take in the natural environment while I’m at it. I don’t listen to music, and don’t want to hear the beep of a watch while I’m running. I run as hard as I feel like, and if that means I run hard and try to outdo myself, then that’s what happens. But that doesn’t happen all the time. I few weeks ago I ran into my school’s librarian at a race, and decided to run with her. I have no idea what our time was, and didn’t care. I knew it was a lot slower than I usually run, but so what? She’s an emerging runner, and I decided that I would run with her and provide some moral support. She was thankful afterward, and I felt pretty good about just running along at a relaxed pace with no particular designs to beat a time or any people around me. I also discovered that if I ran at that particular pace more often, I could probably run 10Ks instead of exclusively 5Ks. The race last Thursday was pretty much a return to the scene of the crime from 2007 when I hurt my Achilles. Same course, same day, similar weather conditions. I tried not to think about it too much, and knew there would be no repeat of the episode because that mindset and that physical condition are far behind me. I showed up, warmed up, stretched, and took off at the gun. I felt great throughout the race, and when I made the final turn, I just kept at it. A young guy who is on the Carthage College football team passed me, as did a few shirtless clowns from the local high school cross country team, but I didn’t do much about it. I was already working at a pretty brisk pace, and knew with a half-mile left that I didn’t have enough left in me to reel in everybody. Besides, I knew I’d be better off waiting until the quarter-mile mark if I wanted to leave anybody in my dust. By that point, though, there was nobody near me. I coasted through the finish line, gangstered as much water and as many bananas as I could, and went home. I hope I’m writing the same thing next year at this time.